Don’t you waste a lot of band-aids like this ? What happens if you get hurt ?! maybe she puts them in her comic after she uses them. that way there’s no waste! 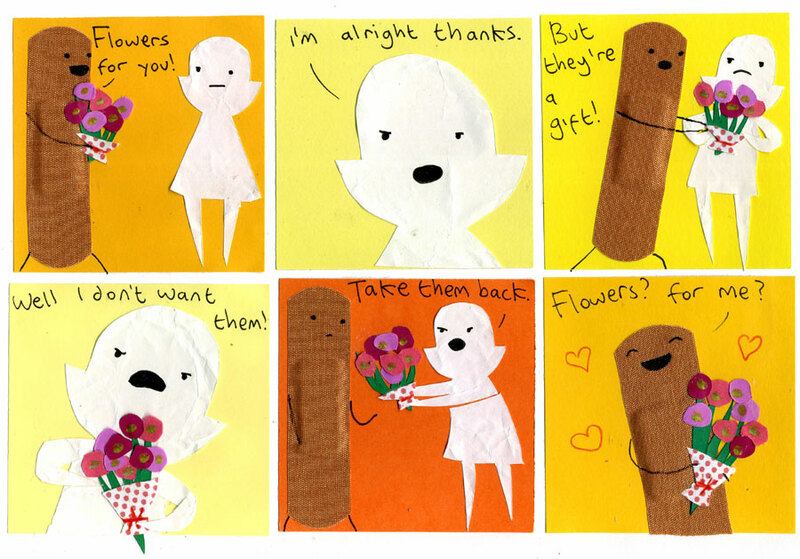 Who doesn’t want flowers? Pauline is weird! On the other hand, Dr. Bandaid’s reaction is priceless! Rofl It’s amusing how clueless he is. do you think he’ll ever learn? Wow. He took them… Wow. oh man drB! how sad this makes me ur are soooo desperate for affection even if its negative :O snaps out of it man! Oh my! Dr. Bandaid! Don’t fall for it! It’s all an illusion!